My name is Mahesh Kumar residing in Mayur Vihar New Delhi with a small family consisting of my wife and my kid Tathastu. I earn 8000 per month.We were happy in our small world but it,s not the same right now. About Tathastu - He is very loving and bright child in school, he loves to study and play. 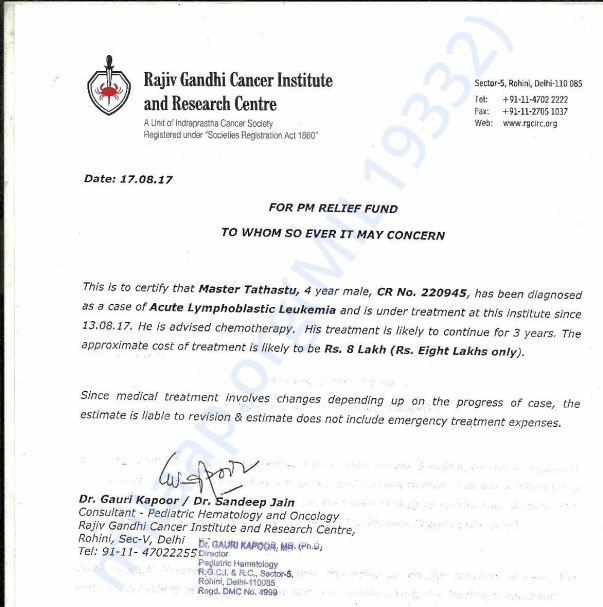 But unfortunately, my son Tathastu who is suffering from ALL(Blood Cancer) and is undergoing treatment at Rajiv Gandhi Cancer Hospital. We are totally in trouble as the amount is very huge. 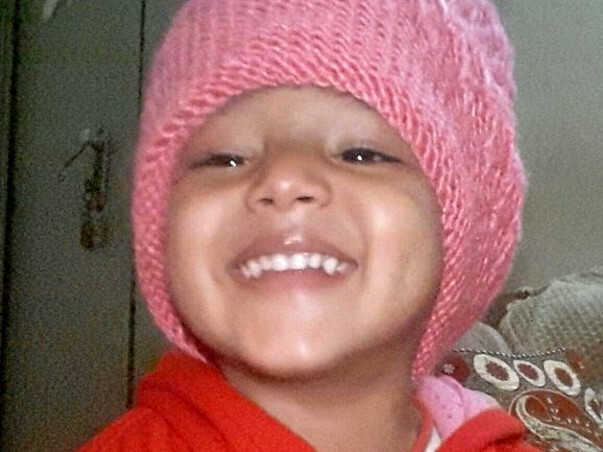 The treatment is costing us Rs.800000 and will be in the hospital for another 9months. We really in need of money right now so that we can save our only child. We are unable to pay the required amount because my financial condition is very poor.Please help us raise the required amount by clicking on the donate button and/or sharing this fundraiser with family and friends. 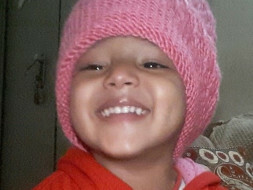 Your small contribution and help will really help us to bring back our happiness to our small family.May almighty God gives you blessings and healthy life. I am thankful to all of you for the love and support. Tathastu is presently undergoing chemotherapy and doing well. He will undergo chemotherapy for the next two years as per the doctor's information. Please pray for his health and share the campaign. Thank you so much for your wonderful love and support. We couldn't have done this without you. It gives me immense pleasure and relief in informing you all that my baby, Tathastu is showing improvement in his health. He undergoes chemotherapy depending on his blood count. If his blood count is good, then the dosage of chemotherapy is reduced. There ares some side effects though. He has neurological disorders. There are some sudden seizures because of chemotherapy. His brain swelled up after the second cycle of chemotherapy but he is fine now. That has completely been cured. It is heartening to see my baby playing and eating well. He's active all day and is cheerful. The next appointment with the doctor is scheduled for 18th May, 2018. Please keep supporting us and praying for Tathastu. Thank you for all the love and support you have shown my son Thastu. He is doing better now and his fourth chemotherapy is going on and he has side effects like nausea, body pain, fids etc The doctors suggest us that this is normal and he will recover from them soon. We are withdrawing all the funds raised for his treatment. The last blood transfusion happen close to one and half month back and his blood count is stable. The next chemotherapy cycle is scheduled for 1st January and the doctors will conduct a few tests before and after the chemotherapy to ascertain the dosage of the chemotherapy and the future course of action. Thank you for all the support. Please do pray for his health and speedy recovery. Will keep you posted.